Iroko by Whitechapel extended in 2000. Hollow box-section iron headstocks with fixed steel gudgeons, ball bearings, traditional-type wheels, stays and sliders all by Whitechapel in 1983 and 2000. At a parish meeting in 1980 held to discuss ideas for celebrating the 700 anniversary of the Church in 1984, the final suggestion was to rehang the bells. Imagine my surprise when told of this as I was not at the meeting. This rose through the list to become the main item together with installing a meeting room under the tower. The St John’s 84 committee was formed and at the first meeting I was informed I would be Chairman. So started much fund raising and organisation. I met the representatives of the Bell Hangers visiting the Tower for the preparation of their quotations. They informed me of the towers they had done recent work in. I contacted the ringers and then visited the examples of their recent rehangs talking to them and taking photographs of the installations. A synopsis of the quotes was made and circulated to all members of the PCC. The PCC meeting to discuss the project took place on Jan 27th 1983. After a slide show and a discussion I was asked who we should place the order with. A lot of responsibility on one person for spending £16,000. The decision was made to place the order with Whites of Appleton for a 6 bell wood frame positioned under the existing frame lower down the tower. A final peal of Plain Bob Minor was rung just before preparations for the rehang. In June we started to strip out the necessary items out of the tower for the removal of the bells, the old frame would be left in position as we had plenty of room for the new installation lower down the tower. In August ARC Maintenance department took out the bells and transported them to Whites. Returning from a few days away in September there was a message from Sandi to ring Brain White urgently. He informed me that a 7” long crack had been found in the head of the tenor running into a porous area. The options were, cast a resin pad to hold the head, there being no guarantee that the crack would not run, have the bell welded, welding was in its infancy then, or have the bell recast. This decision had to be made quickly as our bell needed to be recast before Whitechapel commenced casting a ring for Miami Cathedral later in the year, otherwise we would miss the 700 anniversary date. With a recast bell you need some additional inscriptions. After much consideration I came up with the inscription we have which fortunately was agreed by all, I remembered Brian White saying Fred Sharpe had his “Signature” F cast on the bell he and Mary Bliss presented to Gloucester Cathedral and I wondered if our 1984 logo could be cast on our tenor. Whitechapel produced two blocks hence we have a unique inscription on our bell. On 3rd November 3 of us arrived at Whitechapel to see the casting of the bell. Although I have been in engineering all my life and been on visits to metal works whilst at School and College it was something special seeing your bell cast. On the 25th February a visit to Whites at Appleton enabled us to view the Tenor, frame and fittings. With the installation in the new position a new floor with an access ladder would be needed below the frame. Having designed and drawn the new floor I sent it to Whites for to see if it met their requirements as to position of trapdoor etc. Subsequent to their comments the drawing was finalised. All the time the bells were away a stalwart team worked most weekends preparing the tower for the return of the bells, removing unwanted items, cleaning loose stone from the walls and installing the new floor and access ladder. Sodbury Vale Builders did the building work for the new floor and frame. 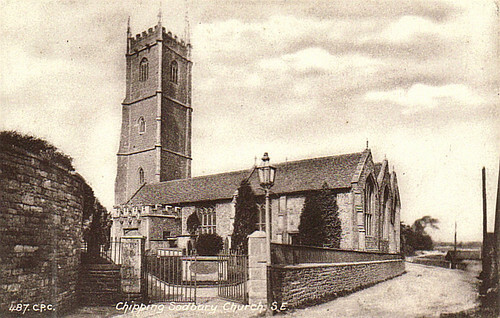 Looking towards the 7th Centenary celebrations and dedication I started researching historic information and Churchwarden’s accounts to prepare an article for the Ringing World together with an advertisement for the celebrations. This was in the April 27th issue. Bright and early on Monday 12th March ARC delivered the bells frame and fittings. The girders were erected and equipment moved into the Church. Monday 26th March the installation of the bells and fittings commenced and was completed by mid afternoon on Thursday 29th ready to try out at 7.00 pm in the evening. The first service ringing on Sunday 1st April was for the Mothering Sunday Service. The 7th Centenary Celebrations commenced with the rededication of the bells on Sunday 6th May. Wednesday 9th May Anniversary day a Peal of Plain Bob Minor was rung in the afternoon and the Centenary Celebration Festival Service took place in the evening, the preacher being The Rt. Rev Philip Goodrich, Bishop of Worcester. A Festival with Flowers on Friday, Saturday and Sunday with the Branch Striking Competition on Saturday afternoon and Confirmation Service by the Bishop of Gloucester on Sunday Morning and a Festival Evensong completed the week.